This lace vest/cardigan is pretty straightforward to knit. The lace pattern is a simple, easy-to-memorize four row repeat, perfect for tv or knit night knitting! It’s worked in three pieces- two fronts and a back. Once the pieces are seamed, you pick up stitches for a hood, then finally, you knit garter stitch bands all around the front and the armholes. An i-cord tie finishes the vest off, but if you hate knitting i-cord, you could make a long twisted cord, or just use a thin belt. If you’d like to make it a swimsuit coverup instead, lengthen the fronts and back by 8-10”, then follow all other direc-tions as written. You will need to plan for extra yarn if you plan to lengthen the body. 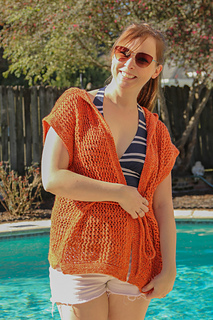 If you don’t want to knit the tie, this is a great opportunity to use a shawl pin to close the front of the cardigan, or you can simply wear it open. Excellent photos courtesy of my father-in-law Jim Ringelman.